(CNN) -- Rebel attacks north of Goma in the Democratic Republic of Congo prompted thousands more civilians to flee Tuesday, and U.N. officials said a U.N. convoy trying to provide security near Goma also was attacked. 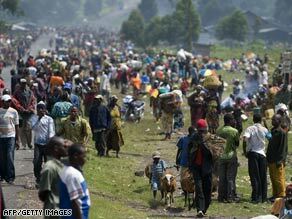 Thousands of displaced Congolese on Tuesday line the road near the Kibati camp north of Goma, Congo. "Five rockets were fired on two U.N. armored personnel carriers that were part of the convoy of MONUC Blue Helmets near Kalengera," according to a report on the Web site of the U.N. Mission in the Democratic Republic of Congo, known by its French acronym, MONUC. "MONUC reiterates that under its mandate it will continue to intervene with all of its means to ensure the protection of civilians and to protect the urban centers of North Kivu," MONUC said, referring to the province in eastern Congo. The attacks by rebels of the National Congress for the Defense of People, or CNDP, led civilians to seek refuge in Goma, the provincial capital, where national army forces surround the city, said MONUC spokesman Jean-Paul Dietrich. He said U.N. helicopters flew overhead to provide cover until darkness fell, when the aircraft were grounded for the night. Dietrich said a U.N. official in Goma reported that the town of Rutshuru had been captured, although he had not confirmed the information with the military. Rutshuru is a territorial capital about 37 miles (60 kilometers) north of Goma. The U.N. convoy that officials said was attacked was providing security on the road from Rutshuru. Dietrich said clashes between the rebels and government forces had taken place during the day in scattered locations. Bertrand Bisimwa, a spokesman for the rebels, told The Associated Press the rebels' front lines are within within 12 miles (19 kilometers) of Goma, a city of 600,000. U.N. refugee agency spokesman Ron Redmond said the Kibati camp for displaced persons tripled in size in a matter of hours Tuesday, The AP reported. "What are they doing? They are supposed to protect us," AP quoted displaced person Jean-Paul Maombi as saying. Between 800,000 and 1 million displaced persons are living in camps run by the United Nations and other organizations in the area, Dietrich said, including about 150,000 people who came to the camps after August 28. "I think right now it's a very delicate situation," he added. On Monday, U.N. gunships supported army forces as they fired on the CNDP rebels in an effort to halt their advance on Kibumba, to the north, Wildenberg said. "We have put all our resources on alert to deter any further progression, trying to contain the aggression in those areas. CNDP is not listening to anyone anymore," she said. Renewed fighting erupted Sunday when the CNDP, led by renegade Gen. Laurent Nkunda, seized a major military camp and gorilla park just one week after a U.N.-brokered peace accord, according to U.N. and park officials. The rebels, according to Wildenberg, are surrounding areas where displaced persons are housed as a "strategy used to put more pressure on government and on the international community to get some of their requests satisfied. This is unacceptable and a violation of humanitarian law." Although the civil war in Congo officially ended in 2003, recent fighting in eastern Congo between government forces and rebels has displaced thousands. Fighting and the related humanitarian crisis have killed some 5.4 million people since 1998, and 45,000 people die there every month, according to an International Rescue Committee report in January.